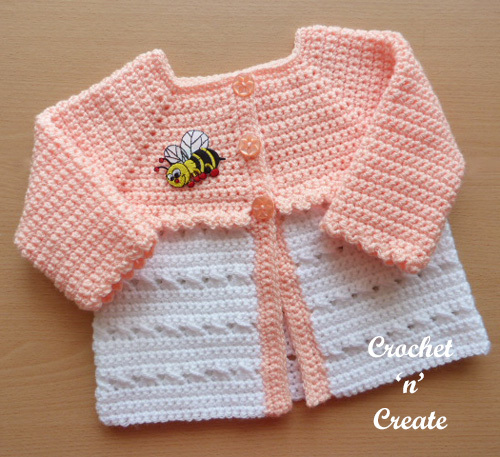 A sweet and cozy crisscross matinee coat, this cute baby sweater can be crocheted up in no time at all. Leave open or fasten with the three small buttons on the yoke, made with easy stitches of sc and cross stitch. Can be made into a 2 part set by pairing with my Baby scatch mitts pattern or if you want to make a 3 part set add my crisscross bonnet pattern, will make a lovely set to give as a gift. The crisscross matinee coat is worked in one piece starting with yoke. 2nd Row – ch1, 1sc in base of ch1, 1sc in each sc to end. Turn. 19th Row – Working in back loop of stitch for this row only, join in color 2, ch1, 1sc in base of ch1, 1sc in each sc to end. Turn. 20th Row – Working through the both loops of stitch from now on, ch1, 1sc in base of ch1, 1sc in each sc to end. Turn. Starting with ch1, 1sc in base of ch1, work 26 more rows of 1sc in each sc, slip stitching to first sc and turning at the end of each row. Next Row – ch1, (1sc, ch3, 1sc) in next sc, * skip 1sc, (1sc, ch3, 1sc) in next sc, * rpt from * to * to last sc, skip 1sc, sl st to first sc on beginning of row. Fasten off. With neck towards you, working downwards on coat, return to loose loops on the bottom of the yoke (the one’s you created on the 19th Row), join in color 1 and ch1, 1sc in base of ch1, (1sc, ch3, 1sc) in next sc, * skip 1sc, (1sc, ch3, 1sc) in next sc, * rpt from * to * to last sc, work 1sc in last sc. Fasten off. Button/Buttonhole Bands – With RS facing and 4.00mm hook, rejoin color 1 to base of right hand side of front edge, ch1, 1sc in base of ch1, work 42 more sc evenly in row ends to neck edge, 3sc in corner, 1sc in each ch around neck, 3sc in corner, 43sc evenly in row ends down second front edge. Turn. Starting with ch1, 1sc in base of ch1, work 1sc in each sc to neck edge. Turn. Work one more row in sc on these stitches. Fasten off. Have fun making the crisscross matinee coat, make sure you pin this pattern to your boards on Pinterest with picture link below. Hugs until I speak to you again soon with a new free pattern. The written instructions and pictures for this free crisscross matinee coat pattern are copyrighted to crochet ‘n’ create © 2017. If you wish to share this crisscross matinee coat pattern on social media or your blog please only use a direct link to the pattern page on crochet ‘n’ create. 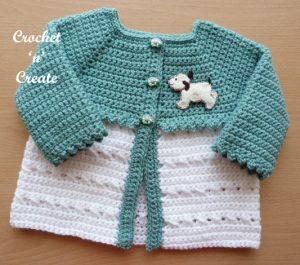 This entry was posted in Baby crochet pattern and tagged baby crochet cardigan, baby crochet patterns, baby crochet sweater, free crochet patterns on 11th April 2017 by crochetncreate. This is lovely! Can you tell me if these directions are written in UK or US terms? Thanks! All the crochet patterns on Crochet ‘n’ Create Darlene are written in USA format.